Johannesburg architects Nieuwoudt Architects are experts when it comes to sleek design and cutting-edge architecture in the local industry. Today at homify, we are going to look at one of their homes, which features a country look and feel as well as panoramic views of the surrounds. Modern design meets classic beauty in this fabulous, functional and inviting home. Nick Love once said, Two things revolutionised life: moving to the countryside and falling in love. Today we will not only witness how beautiful this country style home is, but we will fall in love with it too! From the front of the home, we can see that this may be a country-style home, but that doesn't mean it is humble in size or design. This home is large and expansive with many rooms, a large garden and a satisfying living area. 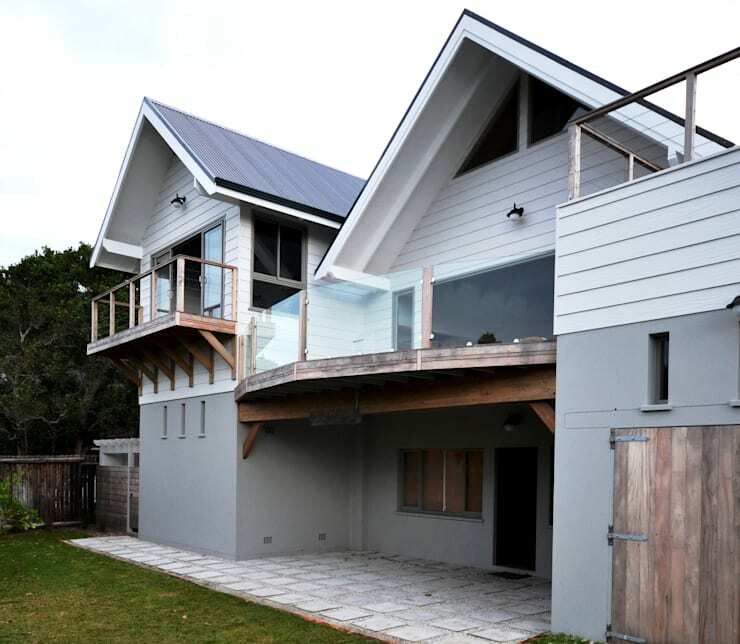 The designers have gone for a grey facade, bringing in different tones and shades of the colour, which complements the wooden finishes beautifully. This is also a true South African home in terms of how it utilises outside spaces! The designers have featured balconies and terraces throughout the home, ensuring that there is plenty of space for lapping up the sunshine in the warm, summer months. Don't you think this terrace is the perfect spot for a good old braai? If we head inside the home, we first come to the bedroom, where we can see that the designers have gone for a very industrial chic look. 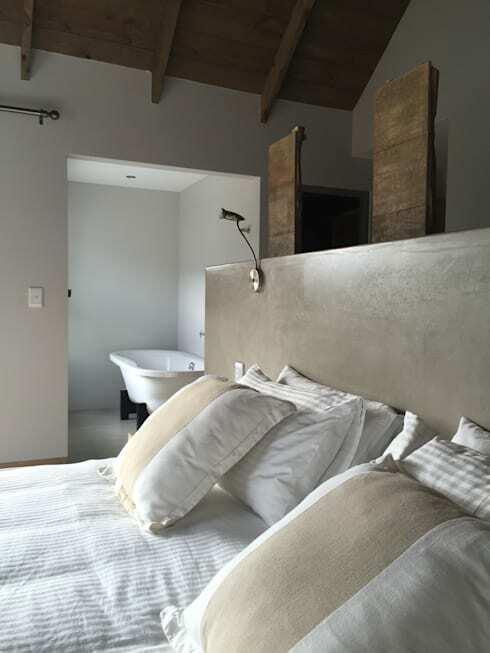 They've opted for very natural and warm materials including a cement headboard, wooden panels and restored ceiling beams. They've paired this with soft cream and white linen, which creates peaceful and tranquil setting, contrasting with the textures and tones. We can see that the bedroom leads into the bathroom, which features a modern bath tub. This is a very minimalist space, housing only the most functional elements. 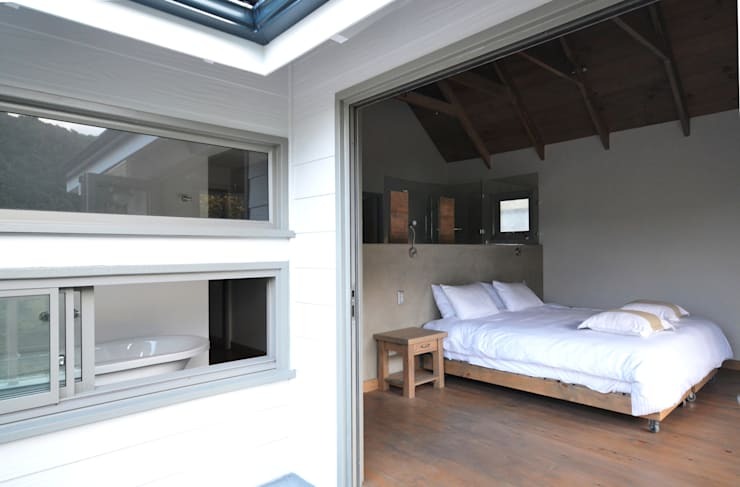 From this angle, we can see how the very understated yet sophisticated bedroom and bathroom opens up onto a balcony. Not only does this allow for fresh air and sunlight to filter into this space during the day, but it also makes the bedroom area that much bigger. The inhabitants can read their book on the balcony or enjoy a cup of coffee while appreciating the views. Thanks to a large window, the inhabitants can also relax in a hot bubble bath while enjoying the scenery, without having to worry about their privacy! If you're inspired by South African homes with beautiful views, have a look at this: Eastern Cape home with champagne views. In this image, we can finally see what all of the fuss is about! The home is surrounded by beautiful hills and valley, which feature all sorts of fauna and flora. You could lie on your bed all day watching nature pass you by. 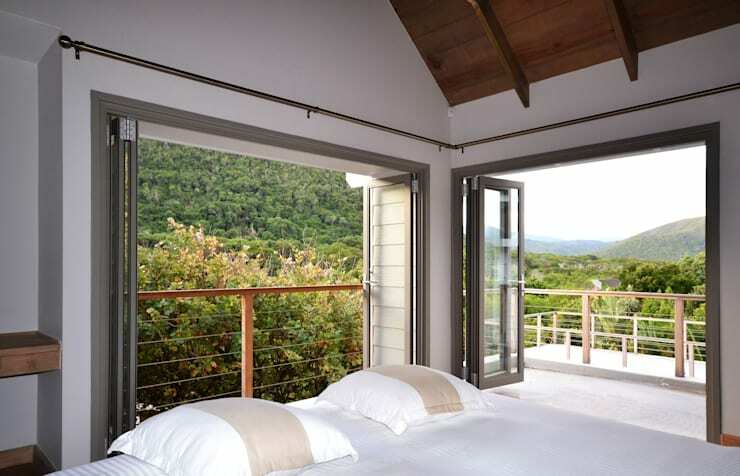 From this image, we can also see how there are doors on each side of the bedroom, which roll back allowing for a seamless transition between the interior and the exterior spaces. For a hot South African summer, this is wonderful! You can relax in your bedroom and let the air flow into the space. In winter, you simply roll the doors closed to create a cosy little haven, without compromising on the surrounding views! 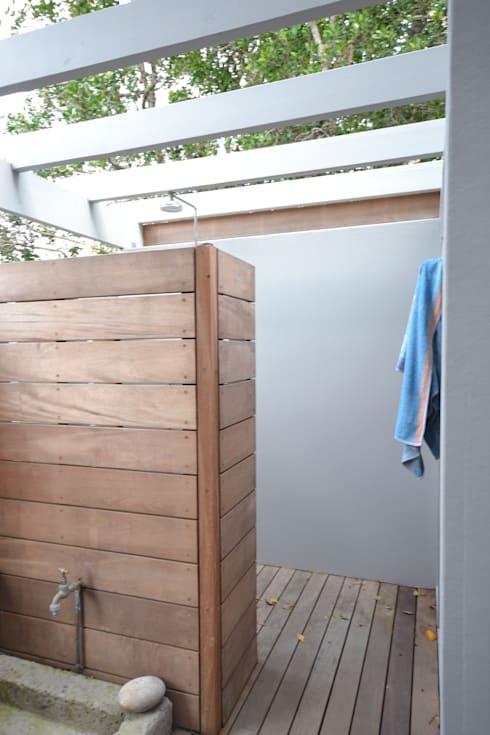 We end off our tour in the outdoor shower, which allows the family to enjoy the nature surrounding them even when they're having a hot shower. The designers have used a dark wood in this design, which blends beautifully into the natural environment. This contrasts with the solid grey walls and white beams, creating the ultimate country look and feel. The designers have thought through the functionality of this space very carefully too. They've included hooks to hang up towels as well as a basin to wash your feet. If you're returning from a long walk in the forest, you can rinse your feet before you step in the shower. If you like this home, you'll also love this: House that defines rustic charm. Can you picture yourself living in this beautiful home?